On November 3, 2005 a madcap idea of making a “Leather Tribal Quilt” somehow managed to get conceived and sort of bubbled out of the mind of Master Steve of Butchmanns. In its first conception it was to be used as a fundraiser for South Plains Leatherfest’s International Master and slave travel fund and somehow get donated to the Leather Archives and Museum (you know, located in Chicago but serving the world). Wiser folk identified that ‘fundraiser’ and ‘donating’ and ‘travel fund’ might get all mixed up and they complained that it was too complicated an idea. One besieged soul suggested it was somehow a secret plot to generate funds for personal use – laughing –YIKES. Well, to put all doubts to bed, the idea matured a bit and blossomed into its current status; The Leather Tribe Quilt. It is now its own beast – a moveable part of leather pride. The Leather Quilt has grown too heavy to ship in one case now. It had to be split into two displays and can now attend even more events around the country. If you don't see your panel in the display, that is the reason. Every year the Curators will exchange the travel cases so all the panels can circulate all around the nation. The Leather Quilt is now in its growth process. 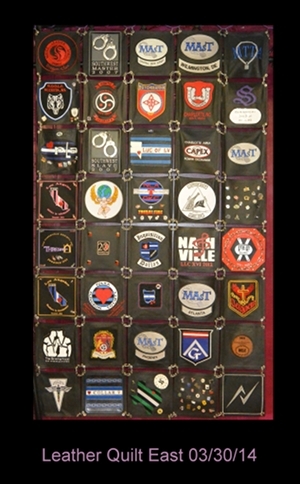 Clubs, bars, groups, individuals, leather families, events, and leather stores are all invited to obtain a blank quilt panel from Leather Masters for $15.00+shipping. 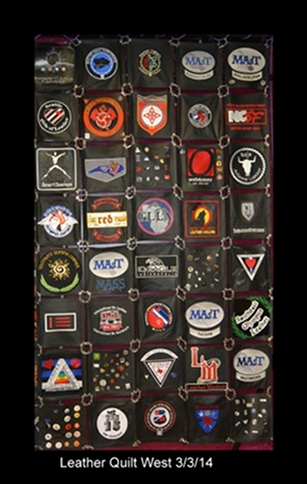 For the first 100 panels sold, Leather Masters will donate 30% of the $15.00 back to the Quilt Project to help with shipping and 70% will be donated to NCSF (the National Coalition for Sexual Freedom). After the first 100 panels, Leather Masters will donate the same split percentage to the Quilt Project & NCSF after costs of making the panel. The quilt will be shown at leather events and will have its own travel fund and volunteer staff. Donations are gratefully accepted to keep it preserved and traveling. 2. 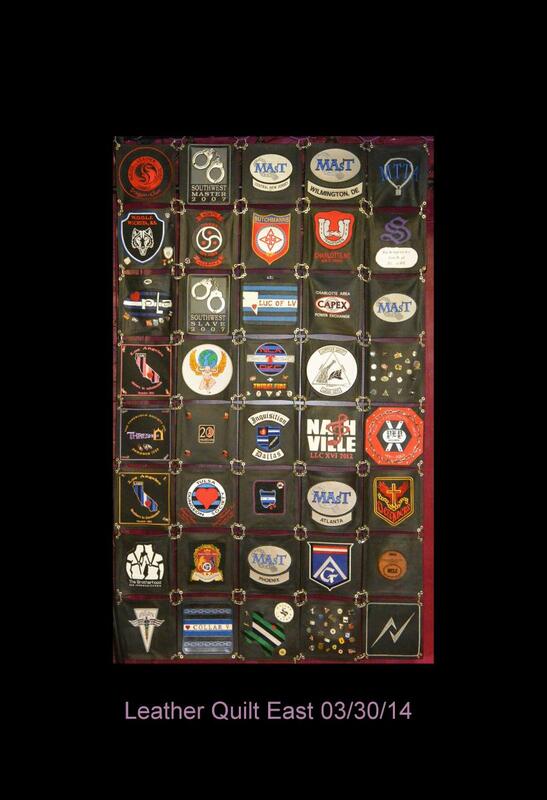 Place your club colors, pins, and any other “reasonable” memorabilia on the panel. Patches must be sewn on (not glued) and pins etc. must have a drop of superglue put on the tip of the post to hold the clips on. 3.Email Curator@LeatherQuilt.com for mailing instructions. 4. You may donate any of the above items to Butchmanns Inc, and they will gladly add them to a composite panel – made up of several groups. They will also have panels made up entirely of pins from assorted groups. Each square should have a one page typed sheet of the history of the panel, listing who made it, a brief history of the club or event, etc., and the history of the patches or pins included on the panels. A digital version for inclusion on the Leather Quilt History CD-Rom would also be appreciated. The digital version should be emailed to Curator@LeatherQuilt.com. If you would like to make a donation to support the project, THANK YOU! You can make your donation out to Butchmanns, Inc. (a non profit educational organization) – please write “Leather Quilt” on your check. There was an initial core group of idividuals and clubs who put in energy, time and/or support. Our heartfelt thanks to them! For more information, questions, or to request the quilt be shown at an event, please contact Curator@LeatherQuilt.com.